IMAGE: Despite its loaction in the city centre core and well-known Luas Cross City plans to reduce the width of Dawson Street, a submission from the AA said the speed limit on the street should be increased to 60km/h. 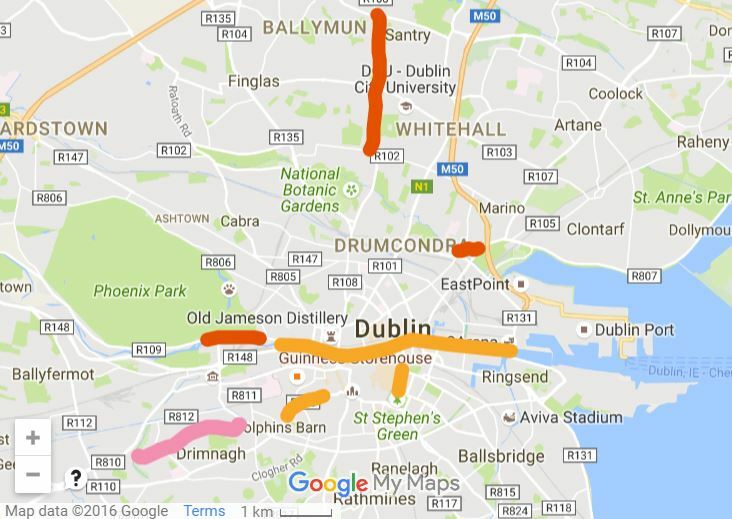 Dublin City Council were told by the Department of Transport to “ensure that due regard” was given to suggestions by the AA, including using 60km/h on city centre streets and 80km/h on urban residential streets and roads. The submission by AA Ireland, a motoring lobby group and insurance company, was one of 550 received as part of the public consultation on the council’s proposed speed limit changes. The main proposals centre on expanding 30km/h speed limits across the city centre and onto residential streets, but exclude most main roads. The city council said that there was around 96 submissions which contained the misunderstanding that its proposals for 30km/h included main traffic corridors or arterial routes, when this is not the case. The council said for those traveling into and out of residential roads and streets that the maximum delay is calculated to be 1 minute and an average of just 30 seconds. IMAGE: Streets and roads where the AA submission suggested increasing the speed limit to 80km/h (red), 60km/h (orange), and 70km/h (pink). These suggestions were rejected by the council. It’s unclear why Auburn Avenue was suggested or reviewed as it is part of the Fingal County Council area, and there is also no 70km/h speed limit. The AA also suggested lowering the limit on Claremont Lawns in Glasnevin to 30km/h. In its report, the council outlined detailed reasoning against the AA’s suggestions, including — the presence of pedestrians and cyclists, the number of junctions, the residential and/or retail nature of the streets and roads, existing traffic calming requested by local residents, and at least in one case the presence of schools. Dublin City Council said it will be retaining the 50km/h limit at City Quay in Dublin 2, not reduce it to 30km/h as previously proposed, and; it will lower the limit to 30km/h on the Inchicore Road in Dublin 8 from the junction with the South Circular Road to the junction with Memorial Road. The proposed implementation dates for Phase 1 (within the canals) & Phase 2 (a selection of suburbs) have been pushed back to March 31 and May 31, 2017, respectively. Phase 3, which will look at other areas of the city, will follow. The city council said that 30km/h limits were shown in Ireland or internationally to reduce collisions and injuries, lower speeds, and lowers noise and air pollution. The council said further engineering interventions, educational awareness campaigns in association with other state agencies and continued enforcement of the traffic law would be needed to enforce the proposed limits. 60kph on Dawson St? 400m of busy shops, eateries, bars at the edge of the Grafton St area with a pedestrian crossing. wtf? Increasing speed limits will simply give motorists more time to spend queued at red lights. The average speed or cars commuting inside the M50 is rarely above 30kph so why do they think increasing speed limits will even make a difference? So bikes being faster than cars is bad and cyclists should wear hi-viz helmets so drivers can drive faster… that’s the AA summed up there. The true extent of the ‘motorisation’ of our society is tellingly revealed here in that the Department of Transport sided with AA Ireland to persuade the City not to designated certain streets 30 km/h. This same department of state knows that it is under the kosh to reduce transport greenhouse gas emissions to comply with COP22 commitments so the more citizens that can be got out of cars the better. Calmer streets are essential to that modal-shift. It is clear that a new regime is in the ascendant within that Department! A regime that is going to renege on climate-change realities. Mike, the demands from the AA (or more likely random people who answered their survey) date back to at least 2012 and don’t necessarily reflect the policy of any politician. Colm, the submission from the AA may well date back to 2012, but does the DOT advice to give “due regard” to this submission also date from 2012, or is it a recent request? In either case, because this is essentially a politically motivated request, it is reasonable to believe that it is likely to have originated from a senior political figure within the DOT, as opposed to being a whim of a civil servant who would be far more likely to respect their own guidelines. aka, the Department request / suggestion dates from December 2014. “due regard” to the AA comments meant ignoring them. In fairness to those who took the time to respond to the consultation, if almost 20% misunderstood the proposal, it suggests the information available was confusing. I certainly thought the graphic with the map was unclear. This was probably the image that had the biggest impact, and was also used by some media outlets. The use of similar colours for the 50kph routes (white) and 30kph routes (cream) didn’t help. At first look, it did appear that the entire core city area was to be set at 30kph. It was only when you took the time to read the consultation paper in detail that you got the facts. I hope when the it comes to implementation, more thought goes into the imagery used to get buy-in from the public. It need to be clear that the areas to be impacted are residential or with significant numbers of vulnerable road users (eg, children, shoppers, tourists). If this doesn’t get approved, I would be amazed. Apologies, I checked and the Department originally circulated all councils with the proposals in Circular RSD 02/2015 dated 1st July 2015. However, some of the individual AA proposals date as far back as at least 2012. I think we can safely ignore anything said by someone who thinks increasing the speed limit will somehow reduce congestion on the quays. Sorry, I should say “we should be able to ignore” but unfortunately we can’t ignore this hodge podge of gibberish presumably dredged up from some motoring forum because people who want to drive faster will believe it because they want to.